Building a play area for your children requires a bit of planning and thought, there are several matters to consider with regards to location, type of surfacing etc etc, Here are some useful tips. Really think about your space. What will fit in? Also consider your children’s ages, and what they are likely to continue to use for some time. A baby swing is lovely for a year or so, but if your youngest is already two, it will have a very limited life span. On the other hand, an assault course trail, planned well, will provide different challenges at different ages, and could keep your children happy for many years. 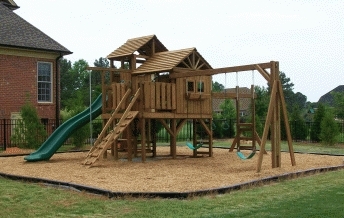 The quality of the play area will depend on how well you prepare the ground. It is no good picking the damp boggy bit of the garden where nothing will grow, and piling on bark chippings. They’ll just get soggy too, and it will be unusable. So assess your site, and decide what you’ll need to do. Will you have to remove lawn? Do you need to improve the drainage? In that case, you’ll need to dig out soil, and add sharp sand to improve the drainage before you add bark chippings. Or does the ground tend to dry out and get really hard, in which case you’ll need extra play area bark to make a soft landing surface. Whatever the issues, you’ll probably need to dig out the area, removing topsoil down to at least a foot or so, to make space for the footings and landing material. You can either make or buy your play equipment. If you’re planning an assault course, quite a lot could be from recycled materials such as old tyres, planks and logs. Do make sure that you check and remove any splinters, and that the wood is sound. If you’re buying, follow the manufacturer’s recommendations for spacing, depth of siting, and how to secure the equipment. Always test it yourself to make sure it will take the weight of your children swinging or pulling in unexpected directions. Finally, you need to add the landing surface. Bark chippings, or play area bark, makes the ideal landing surface. You can buy this from bark suppliers, most of whom will provide details about the necessary thickness of bark, and also a calculator to help you work out how much you need. They will usually deliver in bulk, then all you have to do is spread it out, and the area is ready to play!